Markets go up... and they go down. When you're looking at a market like China, it can go down a LOT, and fast. Chinese stocks have gotten beaten up in recent weeks. And a lot of folks want to know my plan now that things have become more difficult. They know that I've become a major China bull in recent years. I launched a research service devoted to Chinese investments called True Wealth Opportunities: China... And over the long term, I expect my readers will make a lot of money. But you've got to be smart about it. The potential upside in Chinese stocks from here is huge. But you can still lose money in down markets as the long-term opportunity gathers steam. So, while I expect to be invested in China for a long time – likely the next five to seven years – I will not hesitate to cut my losses when Chinese stocks enter a downtrend. Of course, when the uptrend returns, I will get back in again. This is exactly what I will personally do with my own China investments... I will be FULLY invested in the uptrends. And I will use trailing stops on my positions to step aside during the downtrends. Chinese stocks have a history of booms and busts. In 2014, I saw the beginning of a China boom forming. At the time, China was running a huge media campaign. The idea was to get locals and foreigners to buy more shares of mainland companies. And a new tool called the Shanghai-Hong Kong Stock Connect made it all possible. It allowed foreigners to buy local Chinese stocks (called "A-shares") through Hong Kong. And it allowed local Chinese investors to buy certain Hong Kong stocks. It worked. 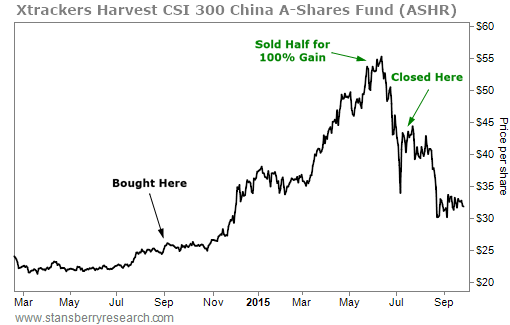 And I recommended readers buy the Xtrackers Harvest CSI 300 China A Fund (ASHR) in September 2014 to take advantage of it. Just four months later, we were sitting on gains of 47%. Chinese A-shares were soaring. And we'd caught the trend at exactly the right time. But at the same time, I warned readers: great booms come with great corrections. Investors were getting too excited. We needed to be prepared to handle the inevitable downturn. We weren't going to be in that China trade forever. The plan was to sell half the position when we were up 100%. That would leave us with only "house money" on the table. And in June 2015, that's exactly what we did. Chinese stocks fell from there. Hard and fast. And a month later, we closed the second half of our position for a 63% gain. Readers who followed my advice captured an 82% return for the whole position in only 10 months. This is what the perfect "bubble trade" looks like. We got in at the beginning of the uptrend. Then, we took profits to make it a "zero risk" play. And we stayed in until we hit our stop loss. Importantly, this is how I still look at China today. Not as a long-term buy-and-hold investment... Not one that I want to own forever. Yes, the long-term story is huge. But it won't be a one-way move higher. We'll likely see plenty of busts to go along with the booms. I want to own China as long as the uptrend is in place. I want to stick around for as long as possible when times are good. But I'll sell quickly when things go against us. You can do this too. Use trailing stops to protect your downside and strategically take gains. That's exactly what I told my True Wealth and China subscribers last month. This will help you get the most out of today's China opportunity... just like my True Wealth readers did in 2014. This is my plan for profiting in China over the next few years: Be fully invested during the uptrends... And use trailing stops to get out of falling positions during the busts. If the trade war headlines scare you, Steve has a surprising discovery to share with you... "Simply put, U.S. companies need China more than Chinese companies need the U.S.," he explains. "This isn't the mainstream view... But the numbers are clear." Read more here. "This growth story has flown under the radar of most Americans," Sam Latter writes. In our Weekend Edition, he shares key insights from the team's recent trip to China – plus the next big story that could send up to $1 trillion flowing into Chinese stocks. Learn more here.